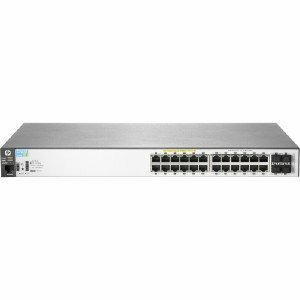 Purchase HP J9773A 2530-24G-PoE+ Switch 24 Ports, Manageable, 24 x POE+, 4 x Expansion Slots, 10/100/1000 Base-T PoE Ports, Desktop, Rack-Mountable, Wall Mountable at Discounted Prices ✓ FREE DELIVERY possible on eligible purchases. We DO NOT accept RMA's or Returns for Non Defective Items. Any merchandise returned for repair and found NOT to be defective by our technicians will have a 25% restocking fee. There will be no exception to this policy. By placing a bid or order with us you have entered into a binding agreement that you acknowledge and accept our procedures. Additional warranty length is available, contact us directly for more details.